Green foothills, rocky cliffs, crystal-clear lakes, and fresh air – this is what makes summer holidays in the mountains really special. Summer vacation in the Carpathians provides a lot of opportunities to fans of both active and calm recreation. Apart from long unhurried walks, hiking, and rock climbing, you can relax in spa or even take an excursion to learn more about the history and culture of the region. Whether you are travelling with your family, friends, or alone, Koruna Mountain Resort is a great place to have Carpathian summer vacation for everyone. Look out for a nice family room or luxury apartments and enjoy yourself with a first-class service, diverse offers and sincere Carpathian hospitality. Where to Go for a Summer Holiday in Carpathians? Koruna Mountain Resort is a dream destination for those who want to escape from busy and fussy routine and switch to the state of absolute relaxation. Enjoy beautiful landscapes and charming nature of the area. Immerse yourself in the atmosphere of absolute peace and unity with the nature. Mountains around the Resort will give the feeling of tranquility, calmness and at the same time power of wild and unspoiled nature. Tasty cuisine will make your vacation in the Carpathians perfect. Dine in an atmosphere of warmth and comfort. Enjoy gourmet menus, themed buffets and regional dishes. Here, you will be able to enjoy classic Ukrainian cuisine in all its richness and variety. Having recharged your energies, you can participate in many different activities the resort complex offers. When planning a trip to the Carpathians in summer 2018, you can combine active and passive recreation types in Koruna Mountains Resort. To relax from the stressful everyday life, you can spend the first few days near the open swimming pool, enjoying the warm summer sun, the atmosphere of absolute peace, and crystal-clear air. Recharge energies in a warm swimming pool with a view to the Carpathian mountains. A personal service and well-equipped recreation area near the swimming pool will allow you enjoy every second of your stay in this resort complex. On the territory of Koruna Mountain Resort, there is a wonderful sauna that will give you a sense of rest regardless of the season. Enjoy the moments of peace and relaxation, at the same time improving your health effortlessly. Find harmony of body and soul by spending a wellness holiday that is entirely dedicated to your well-being. The sauna is designed for 10 people and includes the whole package of services. Bath-house attendant services, besoms, towels, jacuzzi, contrast pool, and herbal tea – all included. When planning summer holidays in the Carpathians with children in Koruna, you should consider visiting the local museum of Hutsul culture. The exhibits of the museum show the household of the mountaineers as well as their origin, rites, and traditions. The private museum of Koruna is a treasure trove of interesting objects Hutsuls used. There you can see everyday clothes of Hutsuls, their painted plates, wooden locks, and even the old baby cradles used before. During the time spent in the museum, you have a chance to learn interesting facts about the Hutsul life, their wedding ceremony, family traditions, and their attitude to life. Art lovers can get a portion of aesthetic pleasure in the modern art gallery Zenko Foundation. The art space is located in the central building of the complex and exhibits art pieces of modern Ukrainian art. There, you can see works of famous Ukrainian painters – everything from drawings and sculpture to installations and video-pop artworks. Expositions change regularly; check the official website of the resort to stay tuned to the projects being showcased at the moment. Fans of playing tennis have a chance to enjoy the game on a professionally equipped tennis court. For doubles, there are all necessary designations; for example, zones of serving are allocated in accordance with all rules. And if you have not taken your sports equipment with you on a vacation, you will be provided with everything necessary for the game. Koruna tennis court is also a good place to practice playing tennis. If you have never hold a tennis racket in your hand, professional coaches will help you with the necessary skills. An outdoor tennis court is located in the ecological zone and is surrounded by forests. Playing tennis on the open tennis court in Koruna is not only a game; it’s time spent with profit to your health. Families spending summer holidays in the Carpathians with children will be happy to hear that there is a well-equipped children’s playground on the territory of Koruna Mountain Resort. Their project designers put much effort to assure absolute safety and diversity of playing activities for children. Stairs, balancers, horizontal bars, swings, slides and even a climbing wall – all these can be found on a children’s playground. It will be interesting and safe for children to play there. On top of that, for the absolute comfort of parents, there are convenient benches where they can relax while watching their children having fun time. Apart from the many things and activities to participate in while being on the territory of the resort complex, there is still much to do. In summer, you have the opportunity for a diverse entertainment outside the hotel: hiking, walking, mountain biking, horseback riding, and much more. You can also take an excursion to any of nearby churches, museums, and parks. 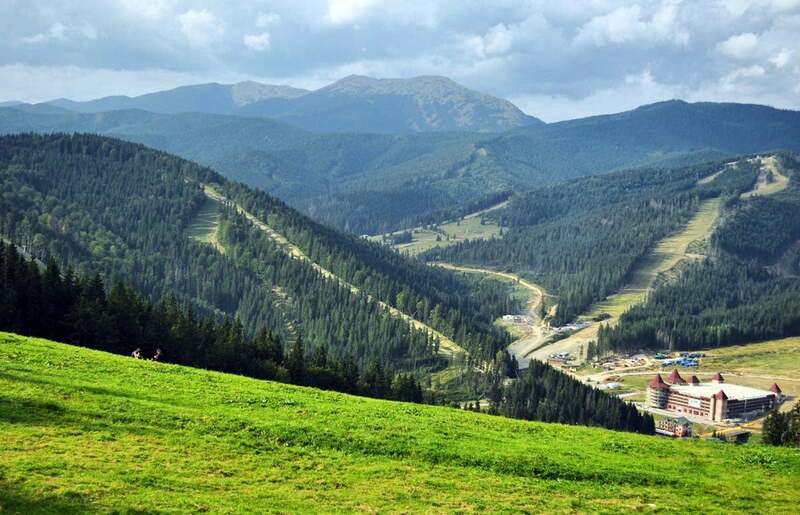 Spending summer in Koruna Mountain Resort is a good way to have an inexpensive Carpathians summer vacation. This is one of the most cost-effective options for summer rest.